ProTrend gives you the confidence to know your measurement data is right. Always right. ProTrend is the North American leading solution for simplifying fluid analysis management while improving the accuracy and integrity of fluid compositions used in measurement and product allocation systems. ProTrend is the unparalleled industry-leading solution that provides oil & gas producers with an accurate, low-cost, lab-independent composition analysis management solution. It improves the accuracy and integrity of fluid compositions used throughout measurement and product allocation systems. Only validated data gets into your measurement systems. ProTrend provides clients with the ability to track, schedule and completely manage entire fluid analysis processes from a single repository, regardless of the lab that performed the analysis. ProTrend’s suite of exports allows clients to easily manage the transfer of analysis data to measurement and revenue systems, which are dependent on fluid quality to perform accurate calculations. Ensure that all measurement and accounting systems are using accurate, recent analyses. Comprehensive validation tool. Ensure that only representative and accurate sample data makes its way into third party software. ProTrend’s Calibration Management provides producers with a streamlined, auditable, end-to-end process for managing meter calibration and verification requirements. It also provides a central repository for all your meter calibration/verification data. 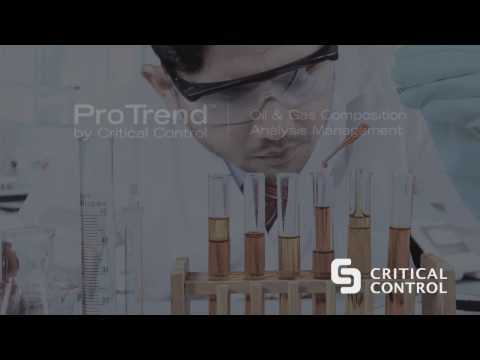 Want to learn more about ProTrend? Contact us for a demo.